Acne pads are often the worst way to fight acne because you have to find just the right ingredient in the right concentration at the right pH. Acne pads are an inexpensive way to fight acne, but they are not usually very effective. Acne pads have to contain at least 45% alcohol to kill acne bacteria. Less than 45% alcohol only irritates your skin and increases sebum production. But 45% or more alcohol also increases sebum production. Exfoliating pads are a great way to open pores and smooth out fine lines and wrinkles, but you need to have the right ingredient in the right concentration at the right pH. If you have fair or dry skin, your exfoliating pad should contain AHAs. If you have dark or oily skin, your exfoliating pad should contain the BHA salicylic acid. The best, and worst, acne pads are mentioned in this article. It is usually easier and less expensive, however, to use an acne treatment system. Most of the acne pad products you can buy for US $10 or less are cloth or cotton pads soaked in isopropyl alcohol, also known as rubbing alcohol. This is not the kind of alcohol you drink, ethanol. Isopropyl alcohol is a relatively non-toxic product that dissolves fats on and in the skin. Some products contain less alcohol, as little as 10%, to avoid stinging your skin. Other products contain more alcohol, as much as 60%, to leave your skin with a tingly feeling after you use the product. But isopropyl alcohol in any concentration can harm your skin. The reason rubbing alcohol is bad for your skin is that it can remove more than just the excess oil that may be in your pores. It can also cause defatting of the skin, causing painful, red, unsightly cracks in the skin that are potential entry points for infection. In the face, the stress of defatting skin triggers a “refatting” reaction in the sebaceous glands at the bottom of skin pores, causing them to produce more sebum than ever before. The result of “cleansing” your skin with a cheap, alcohol-soaked pad can be creation of more blemishes than you started with. Some acne pads, however, can be beneficial for the skin. Some of the most useful anti-acne products are acne pads that contain small amounts of exfoliants designed to remove dead skin that causes fine lines and tight pores in the skin. If you have fair, dry skin, you may respond well to alpha-hydroxy acids (AHAs). These are plant and milk acids including fruit acids, glycolic acid, lactic acid, lactobionic acid, and gluconolactone. These products are used in concentrations of up to 30%, with a doctor’s supervision. If you have darker, oily skin, consider using a product that contains the beta-hydroxy acid (BHA), salicylic acid. Salicylic acid is the only beta-hydroxy acid used in skin care and is not only good for acne, but also lightening dark spots caused by acne. It is used in concentrations of up to 3%, in over-the-counter products and in prescription exfoliants. Darker skin can benefit from the BHA salicylic acid in lower concentrations. Both AHA’s and BHA stimulate the growth of collagen beneath the skin. They help fill in acne scars. They make the skin firmer without making it tight. They increase skin cell turnover, which naturally lightens the skin. Exfoliating pads are an easy way to keep pores open and to prevent spotting of the skin after blemishes have healed. The problem with most products is that they contain the right ingredient in the wrong concentration or at the wrong pH. If the active ingredient in the exfoliating pad is too weak, it won’t have any effect on the skin. If the active ingredient in the exfoliating pad is too strong (something that does not happen in many products), it may cause the skin to turn red, crack, or peel. If the pH of the pads is too low (also a relatively rare problem), they can burn the skin. If the pH of the pads is to high, the “acid” will really be an alkali and not to the skin any good. Acne pads that come in a plastic tub or a jar start losing their potency as soon as you open the container. And any product that leaves your skin feeling greasy also helps create new blemishes. Acne pads that help relieve blemishes without otherwise harming the skin are hard to find. Here is a brief review of some of the most popular brands. Acnefree, 3-in1 Sport Wipes, Acne Medication, 24 – 4″ x 6″ Wipes (US $14.73 for 24 wipes) contain at least one ingredient that helps acne on all types of skin, salicylic acid. They also contain enough tea tree oil to smell good, but not enough tea tree oil to kill acne bacteria. This product is useful after a workout for removing any skin products that might react with sweat, but it is not going to heal pimples or remove existing blemishes. 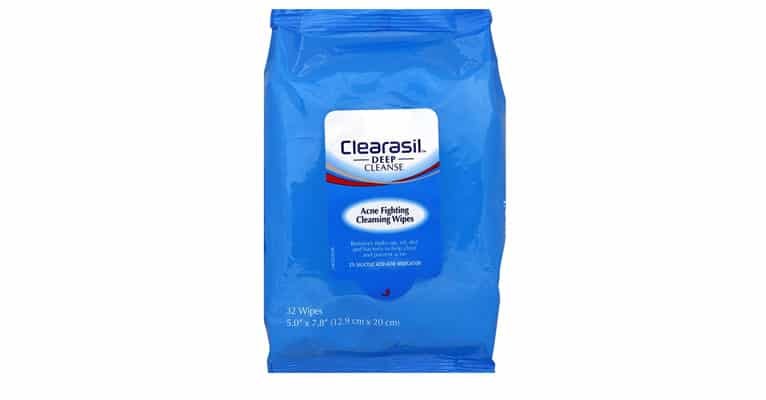 Clearasil Acne Fighting Wipes, at US $5.09/32 ounces, are a low-cost option for removing makeup and cleansing the skin while removing oils and sebum with 2% salicylic acid. Their 2.9 pH makes them effective for opening pores and erasing fine lines and wrinkles after repeated use—just be careful around the eyes. Clearasil Acne Fighting Wipes are actually a decent choice and makeup remover. Douxo Chlorhexidine 3% PS Pads (US $38.48 for a 30 count box) contain a chemical that kills acne bacteria on contact. However, this strength of chlorhexidine is too strong for human skin. Since the product is formulated for skin outbreaks on dogs, don’t try to save money by buying this veterinary product. Noxzema Triple Clean Pads Anti-Blemish Pads, at just US $3.49 for 65 pads, certainly seem like a bargain, but they have the potential to cause severe irritation of the skin due to their trademark combination of alcohol, camphor, eucalyptus, and menthol. These ingredients help your nose know you have Noxzema when you open the container, but they also irritate the skin and sometimes even increase production of sebum. Oxy Daily Cleansing Pads, Maximum ($3.89/ 55 pads) contain the right ingredient, salicylic acid, for oily and dark skin types, but the product is formulated at a pH high enough to avoid burning your eyes and too high to do any good for your skin. The pads also contain 50% alcohol. This enough to kill acne bacteria on contact, but also enough to irritate the skin and actually increase sebum production. Stridex Power Pads ($6.99/28 pads) are a unique combination of cleanser and a low (2.5%) concentration of benzoyl peroxide that kills acne bacteria. Free of irritant ingredients such as alcohol, mint, peppermint, and witch hazel, these non-abrasive pads are suitable for anyone who has fair, brown, black, or Asian skin who is trying to defeat blemishes. If you wear very heavy makeup you may need to use an additional cleanser. Stridex Daily Care Acne Pads ($8.24/90 pads) contain 2% salicylic acid, which is fine. But it also includes menthol and detergents that you don’t want to leave on your skin, especially acne-prone skin. Neutrogena Rapid Clear Treatment Pads ($7.99/60 pads), again, contains 2% salicylic acid. But expect skin to become irritated very fast thanks to the alcohol that dries out the skin and increases oil production, leading to even more breakouts. Sometimes acne pads can be very helpful in getting rid of blemishes. You will get better results, however, from a complete acne care system like Exposed Skin Care. Can I use my moisturiser after cleaning my face with a medicated pad? I use a Thayers witch hazel toner after and then a moisturizer, and that seems to work for me. its a very simple routine .. takes literally 1 minute and this has improved my skin significantly. Why didnt you mention that the noxzema pads also have salycilic acid as the active ingredient? ... it contains the same amount as the oxy - I use them interchangeably and after using them for the first 2 months I noticed my acne improved significantly. It's a good thing i stuck with it because I almost gave up after not seeing results for the first coupel of weeks. I have been faithfully using both for about 2+ years now at least once or twice a day, and are my go-to products for acne, as the ingredients are very similar. I use a witch hazel toner after and then a moisturizer, and that seems to work for me.